Keep your car's cooling system running well. 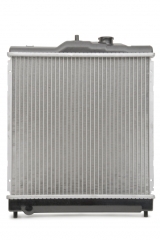 If you've been using tap water in your cooling system or it has been otherwise contaminated with minerals over time, you may even need to replace some of the system components, such as hoses, the radiator and heater core. A well-functioning cooling system is vital to an engine’s longevity, especially in warmer climates.